Halloween is just a short week away, and it is a great time to create memories with the family that will last forever. 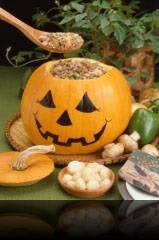 I have been sharing Halloween ideas for more than thirty years, and the most mentioned one is Dinner in a Pumpkin. This is a perfect idea to build a family tradition around. Cut off the top of the pumpkin and thoroughly clean out seeds and pulp. Paint an appropriate face on the front of the pumpkin with a permanent marking pen or acrylic paint. Preheat oven to 350 degrees F.
In a large skillet, sauté onions in oil until tender. Add meat and brown. Drain drippings from skillet. Add soy sauce, brown sugar, mushrooms and soup. Simmer 10 minutes, stirring occasionally. Add cooked rice and water chestnuts. Now, spoon the mixture into the cleaned pumpkin shell. Replace pumpkin top and place entire pumpkin, with filling, on a baking sheet. Bake 1 hour or until inside meat of the pumpkin is tender. Put pumpkin on a plate. Remove pumpkin lid and serve heat. For your vegetable, scoop out cooked pumpkin and serve. Serves 6. 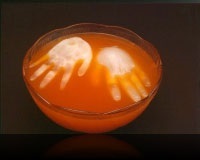 If you want to have a fun drink to go along with you pumpkin dinner try floating hand in a punch bowl. Wash the inside of a surgical glove and fill it with water. Tie a knot or rubber band at the top. Freeze until solid. Carefully cut slits down the fingers and hand with a sharp knife. Peel away the glove, being careful not to break off the fingers. If accidentally break off a finger, do not worry. After all, this is Halloween. Float the hands in a very cold punch or put it wherever your imagination takes it. For an extra spooky effect, put dry ice in the punch, but be sure not to serve the dry ice or touch it. Be very careful with dry ice when kids are around. The temperature of dry ice is 160 degrees below freezing and if it is touched it will cause a burn just as if it were very hot water. Make these fun ideas a family tradition. For more fun ideas like this, check out Dian’s Holiday Fun Year-Round. It is packed with ideas for more than 20 holidays. It is great for mothers and grandmothers that want to have fun with the kids, teach them how to be creative, and share memories that will last forever. Go to www.DianThomas.com for more information.